This couple's wedding in Nairobi was the perfect start to their new lives. From building sandcastles when they were children to building a future as adults, Hiral and Hansil sure have come a long way. The two wed in Nairobi and had WeddingsSutra Favorite Once Upon a Time- Wedding Tales capture every special moment from their big day. The first time Hansil saw Hiral, it was at her grandparent’s 50th wedding anniversary celebrations and for him, it was love at first sight. 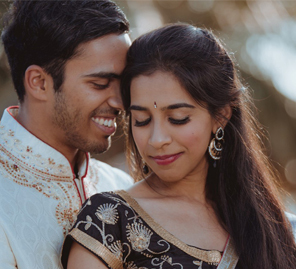 He says, “At that very moment I felt she was the one.” In hopes of speaking to her, he asked a friend, who is also Hiral’s cousin, for her number. As they got talking, they discovered that this wasn’t the first time they were meeting each other. “Our parents have been friends and we had gone on a holiday together as toddlers. We even found a picture of us making sandcastles!” The first time they went out was to a club in 2006 and their bond has only grown stronger ever since. 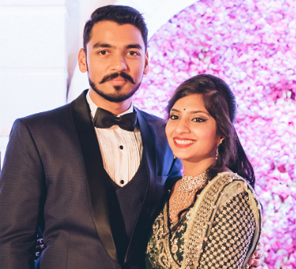 Hiral and Hansil’s wedding celebrations began with a mehndi that was buzzing with excitement. While drapes in vibrant colors set a happy tone, bright orange and yellow flowers added to the liveliness of the setup. The couple also planned a few games and activities for their guests to keep the cheer alive and keep everyone involved. The bride wore a beautiful peach outfit with a blue cape while the groom wore a golden bandi and a printed shirt with a pair of jeans. The following morning they two hosted the mandvo muhrat, a Gujarati ritual for to-be-weds. Yellow and white were the colors that dominated the decor and stages for the bride and groom were each set up for them to perform the ceremony on. Hiral was gorgeous in a white lehenga that she teamed with a green blouse while Hansil looked handsome in an orange kurta and floral bandi. 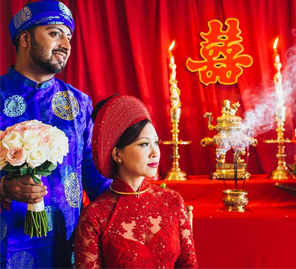 In the evening the couple formally received their guests at a meet and greet, to make each one of them feel welcome and show them their gratitude for being a part of their big day. For this function, the bride dressed up in a blue lehenga while the groom selected a grey suit. The couple wed in an outdoor ceremony the following morning. The lawn saw a barn style set up with haystacks covered in cloth which made for the some of the seating. Keeping in line with the white and pastel color story of the rest of the setup, the mandap was decorated with white drapes and pastel flowers. 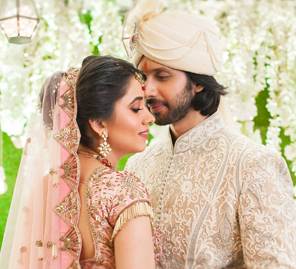 The bride wore a light pink and mint green ensemble while the groom complemented her outfit in a white sherwani. Hiral and Hansil’s wedding was an exhilarating affair complete with speeches from their loved ones, lots of cocktails, performances with family and friends and the bride and groom’s first dance. Their reception was packed with cheer and excitement. The event was followed by a lively after party.